Debbie Schaffer (VisAbility), Grace Austin (7), Felicity Austin, Harry Austin (5), David Templeman (Minister for Culture and the Arts), Elizabeth Spencer (State Library of WA). 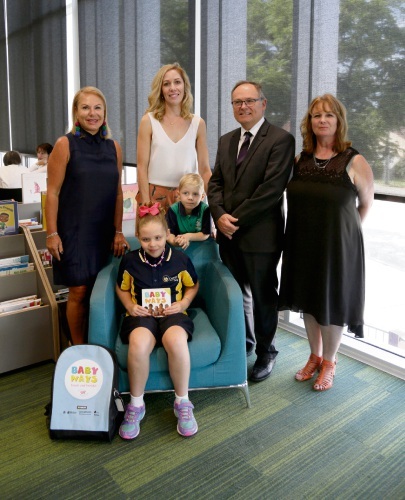 TO celebrate World Story Telling Day the State Library of WA, in partnership with VisAbility, today launched the new Baby Ways touch and feel backpack at Manning Library, as part of its Better Beginnings Family Literacy program. With about 17 per cent of five-year-old children starting school in WA developmentally vulnerable or at risk in their language and cognitive skills according to the Australian Early Development Census (AEDC), Better Beginnings encourages parents to read aloud to their children to promote early literacy. Specifically designed for infants with vision impairments, the program’s new touch and feel backpack that will be available to loan for free from a variety of public libraries includes Braille-embossed editions of the Baby Ways publication, an audio CD with Baby Ways sung and narrated, and tactile objects that relate to the book. Minister for Culture and the Arts David Templeman said the release of the resources for vision-impaired infants was a milestone in the achievements of the award-winning early childhood literacy program. “What a wonderful collaboration; I think we are always at our best when we collaborate and make sure we are all focussed on delivering quality and equity, which is what these recourses are about,” he said. Felicity Austin, the mother of Grace (7) who was born with a vision impairment, said she felt the touch and feel backpack was a welcome move forward. “When Grace was born we didn’t know what her vision was going to be, so we started Braille very early with her,” she said. Through its 14-year partnership with Rio Tinto, State Government funding and the support of public libraries, the State Library produces and distributes reading materials and literacy messages to 96 per cent of newborn babies and 99.8 per cent of kindergarten pupils across the State.